In November, a pictorial book devoted exclusively to Shaughnessy’s workThe Call of Trains: Railroad Photographs by Jim Shaughnessywas released by W.W. Norton & Company. Working from these two perspectives, the men have assembled a striking collection of 170 black-and-white images taken between 1946 and 1988. 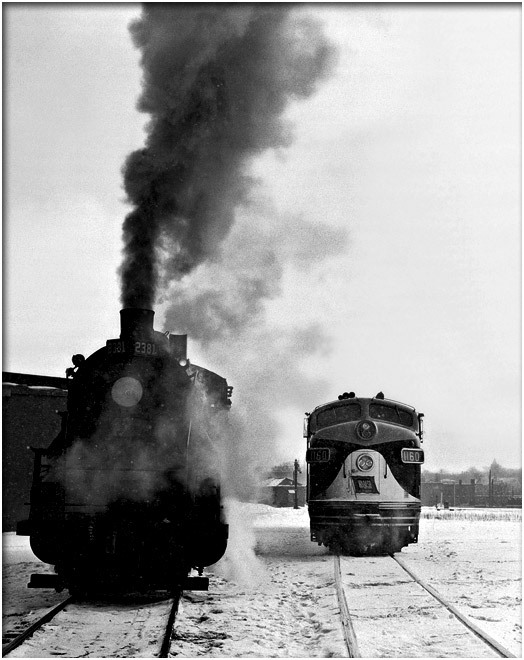 Together the photographs capture Shaughnessy’s contributions to the development of railroad photography in America. Looking back, Shaughnessy cannot remember precisely how train photography took hold of his imagination. The love of machines and of trains was in his blood. His father, James A. Shaughnessy, was superintendent of buildings and grounds for St. Joseph’s Seminary on the southern edge of the Rensselaer campus, and the family lived in a small house on the seminary property. Helping his father maintain the boiler and steam plant that powered the facility, Shaughnessy developed a knowledge and admiration of mechanics that grew and evolved into a fascination with steam locomotion, as the pound and whistle of trains at Union Station just down the hill on Broadway could be heard across the seminary grounds. Before Shaughnessy could drive, his parents encouraged his interest by taking him on countless day trips. While his mother sat in the car reading, father and son would explore railroad locations and talk to railroaders about their work. And the younger Shaughnessy would take pictures. Soon he joined local railroad clubs and other enthusiasts on trips and began establishing friendships with other rail fans. While still in high school, he joined the Model Railroad Club at Rensselaer and became the “mascot” for a group of Rensselaer rail fans called the Boomers. Several of these friendships, which included Craig Woodworth ’53, Curt Law, and David Messer ’60, connected him to Rensselaer before he enrolled at the Institute. Eventually those “rail fanning” trips, usually with fellow enthusiasts, would take him by car and train throughout New York state and New England, into Canada, the far West, Mexico, and the Midwest.